The Episode starts with Karan aiming arrow on Jai and thinks his engagement day will become last day for him. Vihaan messages Aadhya to save Jai as he is in danger. Aadhya is shocked and run towards Jai and falls. Jai moves to hold her. Karan’s arrow hit on the wall. Jai says sorry to Karan and says your magic ruined. Karan says it is ok, and says I will keep this stuff. He goes to room and tells Ragini that he failed. Ragini asks Karan to take the call and talk to her. Karan takes the call and says Shruti, I have failed. He cries badly and says I couldn’t give justice to you. Ragini says our plan A failed, and tells that they will break their engagement as they have plan B. Karan stands up. Aadhya comes there and asks why your eyes are red. Ragini says some chemical of magic, went in his eye. Aadhya says everyone is calling you. Pratima thanks Rupa for agreeing to Aadhya and Jai’s alliance. Rupa says what to do, as Jai’s happiness is Aadhya. Shubhankar comes there. Jai comes and greets him. Shubhankar gives gift to Jai. Aadhya meets him and asks when did you come? Jai steals money from the locker. Ragini signs Karan and comes out. She collides with PK intentionally and changes the money bag with the fake one. Pk tells that he is going for some important work. Shubhankar shows Jai’s ring to Pratima. Aadhya calls Diya and says she is not picking the call. Jai asks her to call PK. Ragini tells Karan that PK must be wondering where did the money go? Karan says time for plan B. aadhya gets message from Diya’s phone that she will come in sometime as her friend is more unwell. Jai asks Aadhya to give her hand. Aadhya says no. Karan brings juice for Shubhankar. Shubhankar drinks it. Karan thinks you will like it, as it is your favorite brand. Aadhya says she was missing Papa, says thank god he came. Jai asks if she is not missing him. Aadhya says you are always with me. Jai says shall I go far? Rupa asks for Shubhankar. Karan makes Shubhankar drink many glasses of wine and then puts money bundle in Shubhankar’s pocket. Ragini tells Rupa that decorator is coming to take the payment. Rupa says I will give money from locker. Ragini then asks Shubhankar to come, and says Dadaji is calling you. Rupa is going and sees money bundle on floor. She thinks it is the same money which she gave to Aadhya for keeping in locker. Ragini pretend and tell Karan that Shubhankar’s money is fallen. Karan says I will give the money to Shubhankar. Rupa thinks her money is in locker. She checks for engagement ring box and thinks it must be in the above locker. She checks the locker and finds it missing. PK gives money to the kidnappers. Kidnappers open the packet and see the waste papers. They get angry on PK and ask him to bring money. Rupa comes to Dada ji and tell that ring vanished, just like money vanished. Dadu says how can money vanished? Rupa asks Dadu to ask Shubhankar and his daughter. She tells that Shubhankar is having money bundle in his pocket. Shubhankar asks what’s wrong, I don’t have any money with me. He checks his pocket and money bundle falls from his pocket. Everyone is shocked. Shubhankar says I don’t know from where it came. Rupa says I had marked om on the money. Jai says it might be uncle’s money. Dadu says we can talk later on, now it is engagement time. Shubhankar says she never wanted this engagement to happen, never and says that’s what I was thinking how she changed. Rupa says you have stolen and blaming me. Aadhya says this must be a misunderstanding, we will solve it. Karan asks Shubhankar to calm down. Ragini says let engagement happen first. Shubhankar says first this matter will be solved and tells that he has no interest in her money. He asks Pratima to give the necklace given by Rupa. Aadhya goes to bring it. Rupa says I don’t want that necklace. Shubhankar gives the necklace to Rupa. Rupa checks and says it is fake. She asks do you want to become hero by giving imitation jewellery. She says keep this necklace with you. She tells that the necklace was very important to her as it was given to her by mummy ji. Shubhankar says I had eaten it, what you will do. Rupa says you people are dacoit type. She asks Dadu to excuse her and tells that she can’t be part of the engagement. She climbs up the stairs. Electricity goes for a min. Rupa falls down the stairs. Jai shouts Mom. Everyone see Shubhankar on the stairs. Aadhya and Jai get engaged and exchange rings secretly. He tells that we will find the truth. 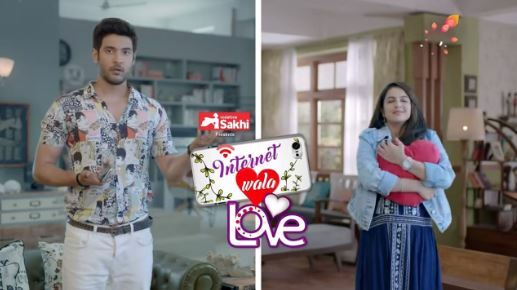 The post Internet Wala Love 7th March 2019 Written Episode Update: Karan and Ragini’s conspiracy halts Jai and Aadhya’s engagement appeared first on Telly Updates.